The Garnier Micellar Water has vastly become a cult product in almost everybody's skincare routine. With not being able to easily get our hands on the Bioderma Micellar water this is the next best thing. The Garnier Micellar Water is affordable, easy to get and best of all does it's job and does it really well! With this product getting more and more popular they also released one especially for Combination & Sensitive skin. This amazing product will only set your bank balance back €6.29 but you can usually get it around the €4.00 mark when theres a deal on. You can soak a cotton pad with this and you're guaranteed that most of your makeup will have dissolved right into the pad and leave no trace on your skin. It also is amazing at removing the likes of waterproof mascaras and eyeliners. 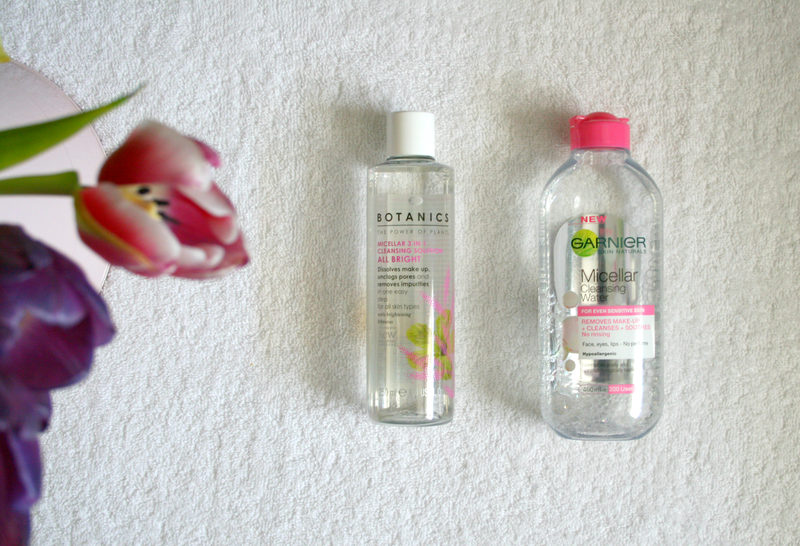 I adore the Botanics range and so of course I had to pick up the Botanics Micellar Water to try out. What I love about this one is that it contains brightening hibiscus so gradually the more you use it you will notice your skin developing a really nice healthy glow without any help from makeup! Now I will be honest I love this as a product itself but when it comes to actually removing the makeup off your face I find that it takes alot more product to do so compared to the Garnier one. It's almost like the first few swipes of it around your face just moves the makeup around your face rather than removing it. So yes it does take more product to actually remove the product but it really does brighten up your skin really nicely. This product will set you back €6.49 or just under €3.50 when it's on offer. To actually remove makeup I do lean more towards the Garnier Micellar Water and I use the Botanics one every morning to just quickly swipe over my face because like I said it really does give your skin a nice glow. So I would recommend both of these products but both for different things! Do you use a Micellar water in your skincare routine? I use the Garnier Micellar Water too, but I'm partial to a bit of glow so might have to check the Botanics one out! Always love hearing about alternative uses for products! i've been using the botanics one for so long now, i absolutely love it! the garnier one tends to irritate my skin slightly with being a bit sensitive, so i always lean on the botanics one, love it!